It is also known as Jacobin cuckoo or Pied crested cuckoo (Clamator jacobinus). It is a member of the cuckoo family. Pied cuckoo is a medium-sized, slim black and white cuckoo as its name indicate. The distinctive crest, white wing patch on the black wing and the pattern make it unmistakable even in flight. But what gave out its presence without even seeing it, is its ringing series of whistling call. They are very vocal during the breeding season. We generally observed these birds in pairs or in group of 3 to 4. They call from prominent perches and chase each other with low-level flight in slow wing-beats, mostly hunting near the ground level. We witnessed babblers, myna, and crows sometime trying to drive them away as the species is a brood parasite. Here in Gujarat Pied cuckoo locally known as the Chataka (Gujarati: ચાતક). It has been said to be migrates between Africa and India. 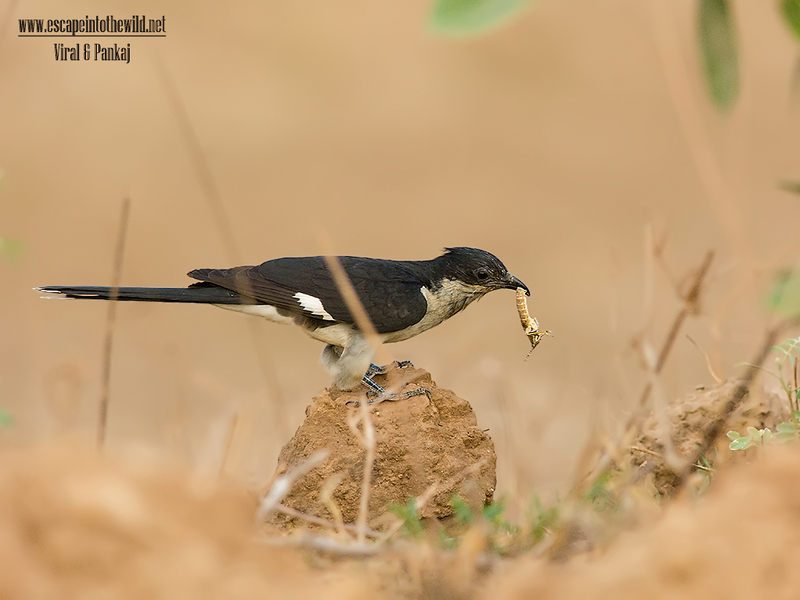 Pied cuckoo arrives in Gujarat in late summer, mostly in end of the May. Arrival of Pied cuckoo considered as a harbinger of the monsoon rains due to the timing of its arrival. Indian mythology and poetry mentioned Pied cuckoo as a bird awaits for rains eagerly with a beak towards sky to quench its thirst. Therefore, on these two basis pre-monsoon arrival and mythology, local people strongly believe that the "Chatak" only drank raindrops, which is not entirely true. Here at our residence in Patan, pied cuckoo regularly visits our makeshift water pots to drink water. Before drinking water it literally shouts its present, mostly came in pairs. One is drinking while other is perched nearby. Generally they are feeding on Painted grasshoppers, often caterpillars which are present in numerous number during this season. They stayed here in whole monsoon season, disappear in early winter.